As a startling revelation it has stunned even those who shot to limelight. Perennially living in the shadow of the more ‘glamourous’ boys pursuing ‘happening’ streams like robotics and mechanical, students from Civil Engineering stole the thunder from right under the nose of their ‘elitist’ batch-mates. And that was the biggest talking point of Adsophos-2016, a national-level tech fair that was organised at Muffakham Jah College of Engineering And Technology (MJCET). 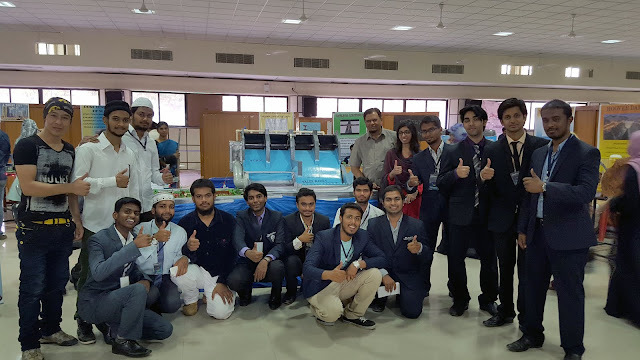 Spearheaded by Ibrahim Mahmood Shah, Team Civil Expo, comprising of students from the third and fourth years of their graduation, drew the loudest applause when it showcased their engineering marvels that exemplified creative ingenuity and bore the hallmark of a vibrant next generation of civil engineers. The real world innovations were crafted with the focus on ‘cost-saving implementation’ as Shah put it. “The students came up with innovative ideas like walls made of waste plastic bottles, which reduced about 30 per cent of the cost compared to normal brick wall and was 1.5 times stronger in compressive strength according to the tests done in the Concrete Lab. Bio-sand filter was another cost-saving exhibit that won appreciation for its resourcefulness,” he explains as his teammates nod in approval. 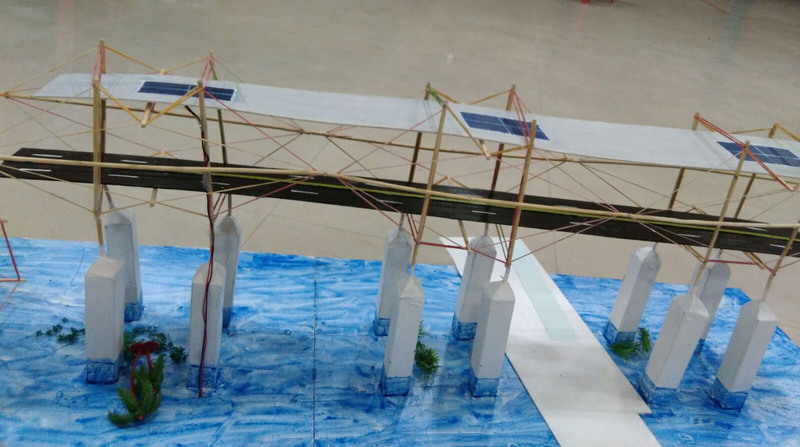 Making light of the generally presumed notion that the ‘arts and crafts’ mindset-driven civil teams were inept at devising technical innovations, the Civil team showcased Tensegrity Bridge with precision-driven solar panels that caught the technical brains off-guard. “We hope Hyderabad implements this pretty soon, as we have lesser space to walk and more electricity to consume,” says Irfan, a third year civil student. The installations not received praise from Zafar Jawed, Secretary of the Sultan-Ul-Uloom Education Society, but also Dr Moinuddin Ahmed, HOD of the Civil Engineering Department and faculty advisor, Barkat Ali Khan. The working model of a multi-purpose dam was the cynosure of all eyes at the two-day expo. A Pelton Wheel made of plastic spoons and old CDs was made to generate a power up to 30V under full flow condition. “It should rank as one of the cheapest known turbine,” exulted Abdul Kareem, chief-coordinator who made economic sense of the turbine. “It is this time when students understand the value of team work. The Pelton Wheel concept is very tricky to be explained, the students did a commendable job,” was the tribute by Dr Moinuddin. An agricultural field with real seeds plantation was laid alongside the dam at an angle of 20 degrees while water was supplied from an outlet. Md Tayyab, Amreen Fatima and Ali Baig worked with the Hydro Power generation, by installing a dynamo in the turbine which generated power. Ishaq, Moin, Obaid, Ozair, Saif and Aaquil were among the other coordinators who resolved the water supply system besides putting in place a ski-bucket jump in the dam. Other concepts displayed at the expo included Transportation Engineering, Highway Engineering, Hydraulics, Concrete Technology, Pre-stressed Concrete, Structural Engineering and unconventional methods of construction by using waste products. To students of civil engineering, the expo marked a fantastic occasion to display their engineering dexterity, which they accomplished to wholehearted approval, a rare first for them, so to say.